I think Habitual Rearranger fits me well because I am never settled on designs, colors, or placement of items in our home. I drive Bradley crazy sometimes, but I keep figuring out new and better ways of doing things! I am not striving to be profound or an expert on anything in this blog. It is simply a way to keep a record of all of my adventures - home and life - for me to reference and also for my loved ones to follow along. I am a born and raised Georgia girl. I don't think I would enjoy living anywhere except the south. Bradley and I spent six and a half years in our starter home and are now in our forever home, a 1970s traditional two story brick house. I love getting into all kinds of projects around our house, and I try to document all the dirty details here if for no one else than for me. I finally found the vintage coffee table I’ve been searching for over the last year. The woman I purchased the dresser for this room from offered to keep an eye out for this table, but I wasn’t holding my breath because she had never seen anything like it before. 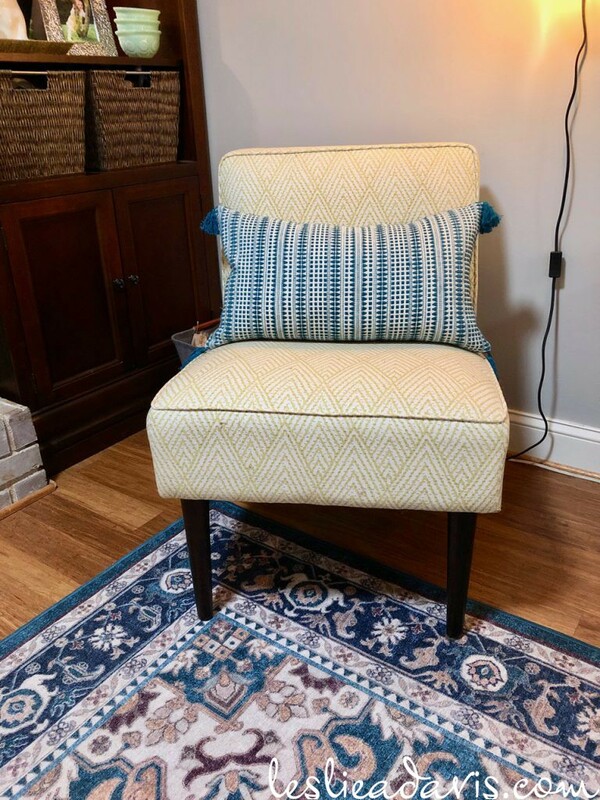 Last weekend, I got an email from her that she had found one at a furniture re-seller in Atlanta that primarily deals in mid-century designs. I fretted right up to the moment we got there when they opened on Sunday at 11:00 am, hoping that no one had purchased it overnight. Luckily not, and now it is mine! And for a fraction of what I feared it might cost. This table is skinny, half the width of our old coffee table, and it fits the scale of the other furniture pieces I’ve chosen for this room. 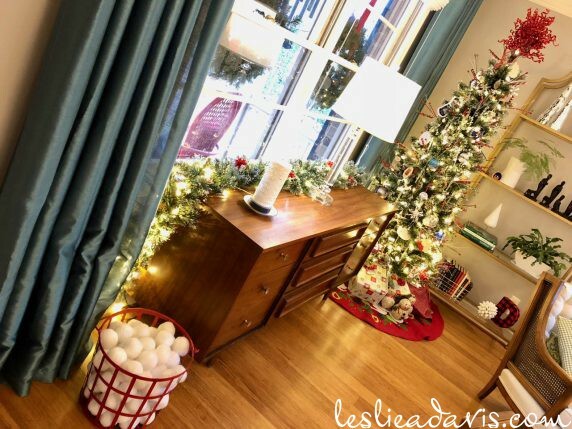 The marble top ties into the round side tables, and the caned shelf ties into the sides of the arm chairs and the wooden end tables on the left side. I think the only thing left to find for this room is a rug. 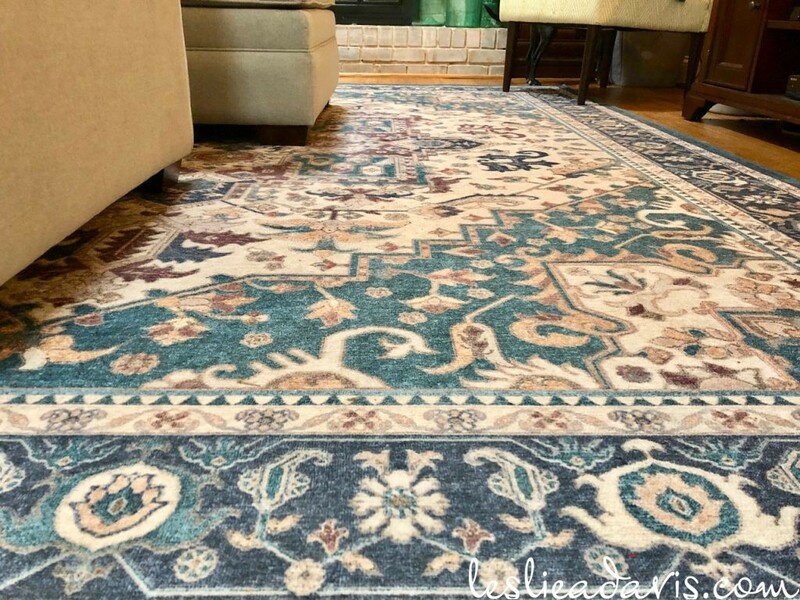 We have been pleased with the Ruggable rug we got for the den recently, so I think we will go that direction again if I can find a pattern I like. 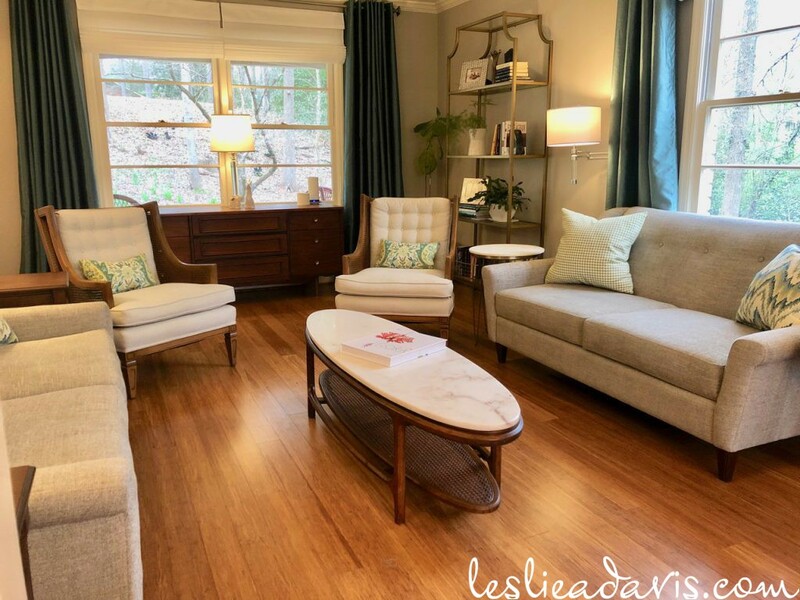 This entry was posted in Living Space, Our Forever Home on March 15, 2019 by Leslie. 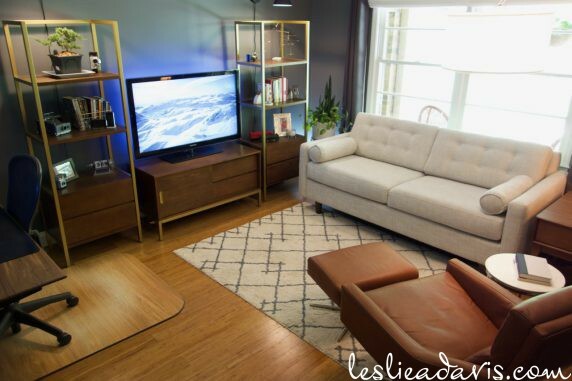 At the end of 2018, we started our search for a new sectional for the den. The recliners we’ve had for the last five years were comfortable, but we had to keep them so far out from the wall so that they could lean back, the room looked a little ridiculous. And the mass of cords visible behind them was an eyesore. 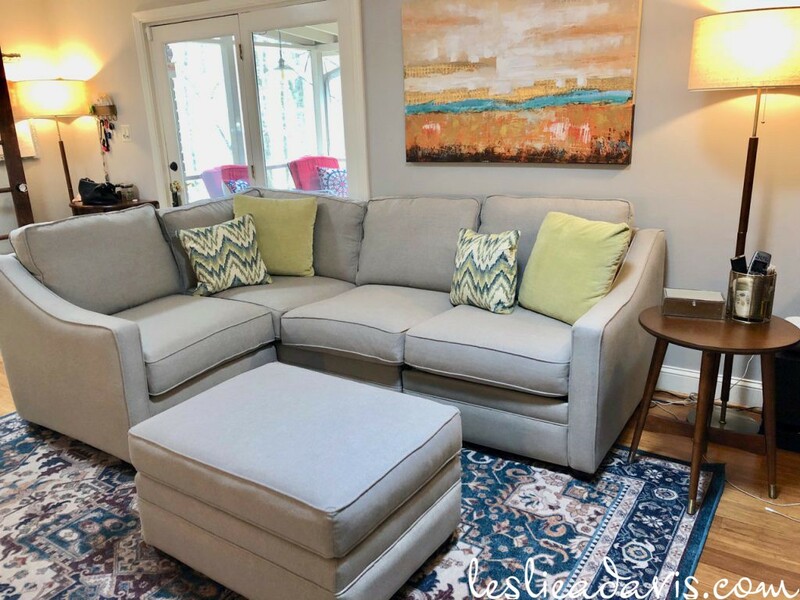 Bradley has always wanted a sectional, and I agreed it would be nice to have a couple extra seats in the room, but I never saw a sectional that was shaped right for our room, that also had a recliner built in. I did not want to lose the reclining function, but Bradley is fine with an ottoman. 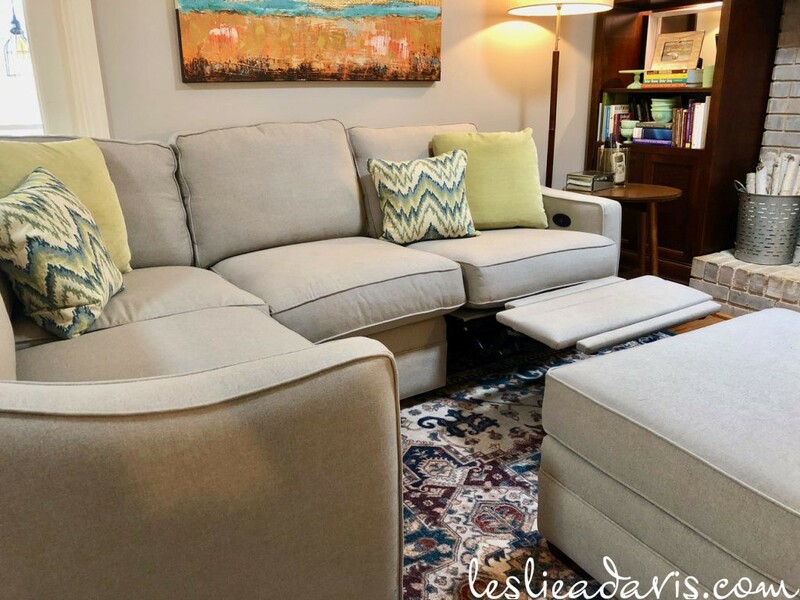 We learned that the furniture store from which we purchased our other sofas offers customizable sectionals, we knew it was the answer. I measured the room and found that they had a configuration that would fit perfectly into the space. The hard part was picking out the fabric. I’ve hated doing that for each piece we’ve purchased and I agonize over it. 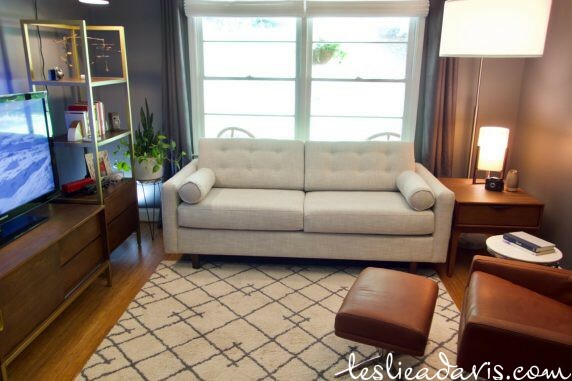 If you ask me, I could have sworn I chose a darker fabric for more of a contrast in the room, but I guess it’s just those darn tiny swatches playing tricks on me. We went ahead and sprung for an ottoman while we were at it. It’s good for Bradley to prop up his feet or to put a tray on to corral things. The slipper chairs were already in the room. They were just a clearance find at Target to give us a couple of extra seats in the room. The rug is also a new addition. I found it online from a site called ruggable.com – they are machine washable! We will see how it does, but for now we love it. It was the perfect find for the room that we hang out in the most and where the dogs spend a lot of their time. 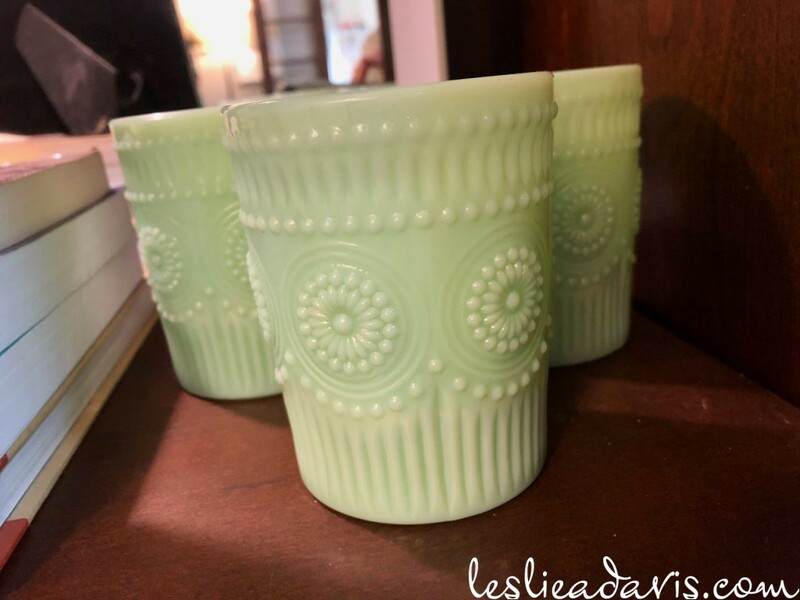 Another small addition were these adorable vintage-inspired green milkglass pieces that I got at Hobby Lobby. I mixed them in on the bookshelves that flank the fireplace just for little pops of color and texture. Finishing touches are always the most difficult part of decorating to me. 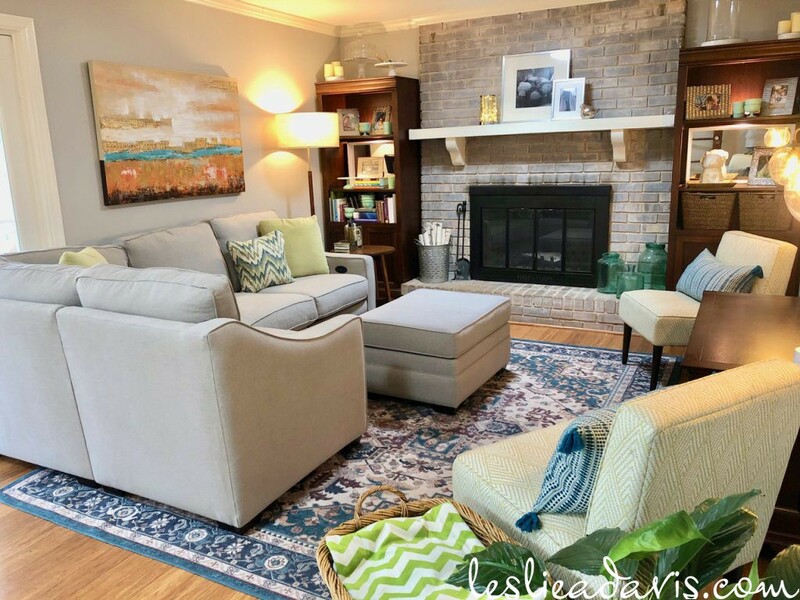 This entry was posted in Living Space, Our Forever Home on March 8, 2019 by Leslie. 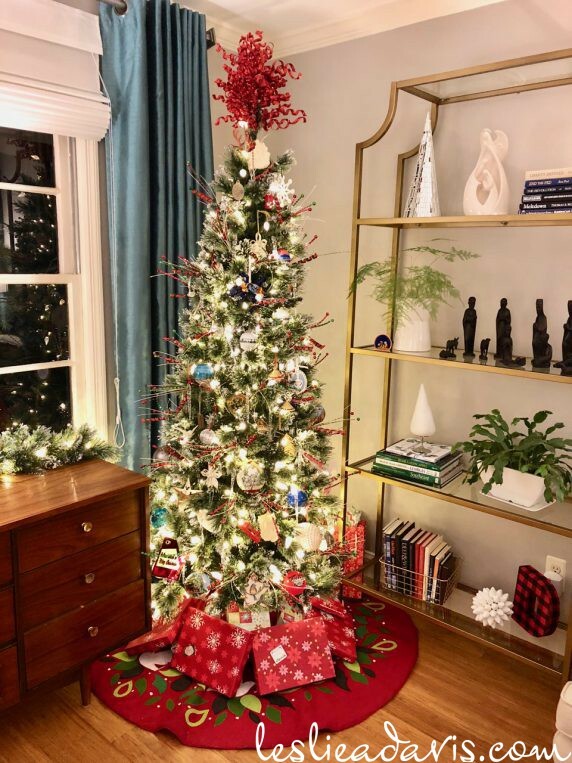 I made a few changes to our Christmas decorations this year, mostly due to rearranging our living room and adding extra furniture over this past year. I finally replaced our artificial tree that we bought in 2007. The new tree has warm white LED lights and is a little shorter than our old tree. It is also narrower, so it fit perfectly between my new etagere and vintage dresser in the living room. Bradley really liked the idea of a garland on the dresser, so I ordered one from the same line as our new tree. The smaller size limited the amount of ornaments I could use this year. 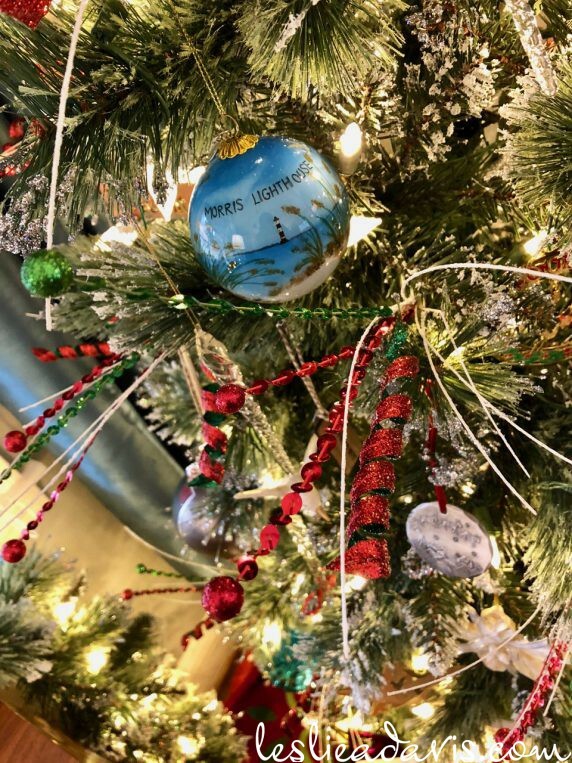 I ended up only using our sentimental ornaments from life events and vacations. I also am enjoying the traditional red and green color scheme that I’m incorporating with my new wool tree skirt and whimsical tree picks. 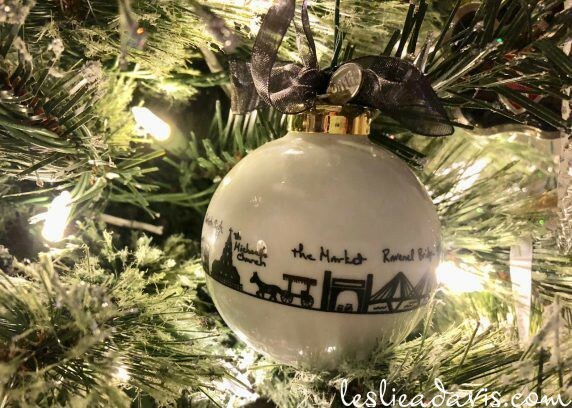 Our new ornaments this year are from our trip to Charleston. We took a boat tour out to an island off Folly Beach where the Morris Lighthouse is located. We also bought an ornament at the Market that matches the one we got in Savannah years ago. On the glass etagere, I sprinkled in a couple of nativities and mirrored trees. The vintage-inspired-light-bulb ornament found it’s home on this shelf as well. 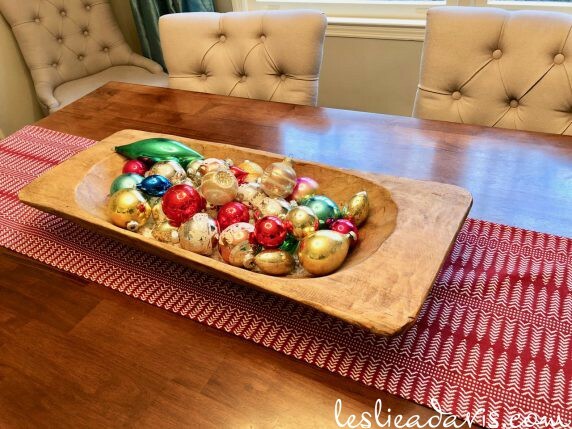 In the dining room, my decorations are very simple. I put my vintage ornaments in a vintage-inspired dough bowl. 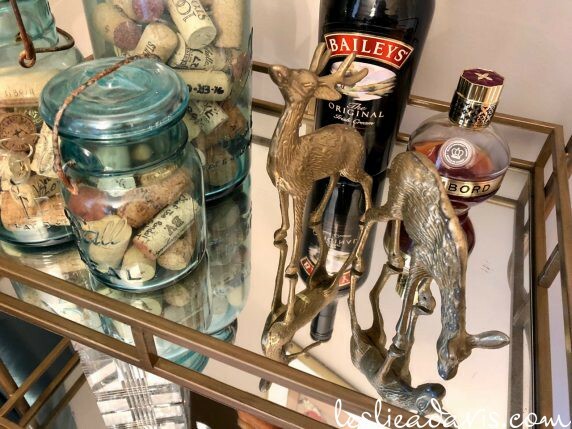 I also added my pair of brass deer to the bar cart. 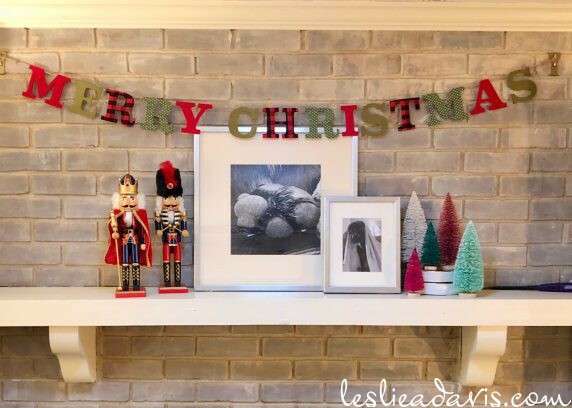 In the den, I left Buddy’s pictures on the mantle and just added the banner I got at Target last year with a couple of nutcrackers that Bradley’s grandmother gave us years ago and some bottle brush trees from the dollar spot at Target. 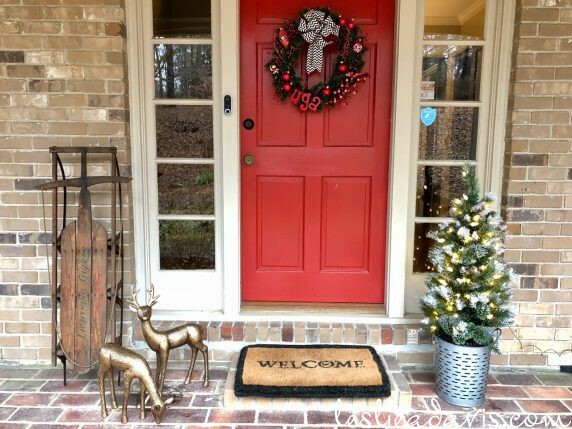 Outside, in addition to hanging a wreath on each of the windows, I added a pre-lit entry tree to my front door vignette. The vintage sled came from Bradley’s grandfather when he was downsizing and the deer were from Home Decorators a couple of years ago. To see my decorations over the years, check out my Christmas landing page. 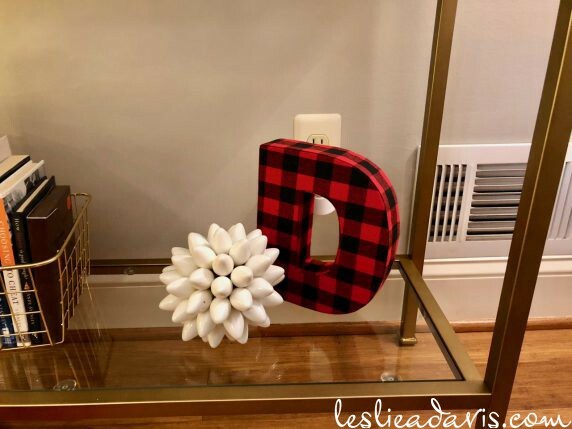 This entry was posted in Holidays on December 11, 2018 by Leslie. 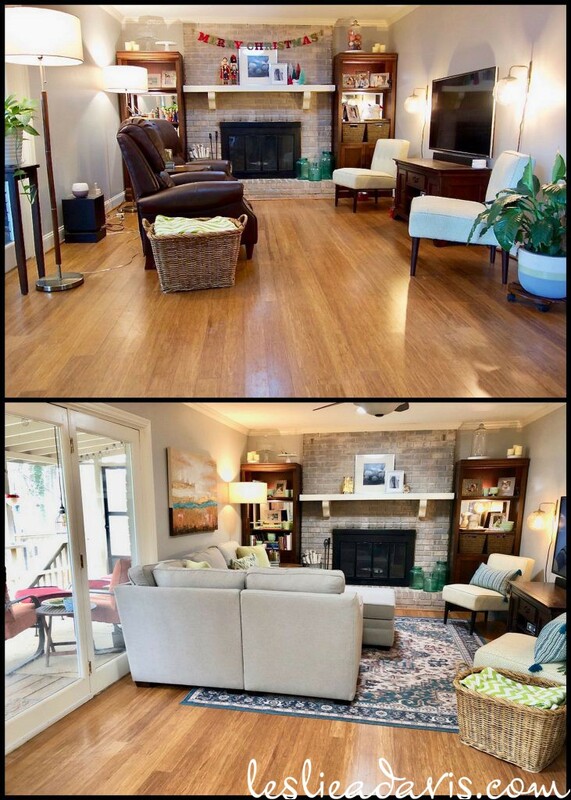 Over the last four years, I’ve been working towards getting furniture for our living room that better fits the space. 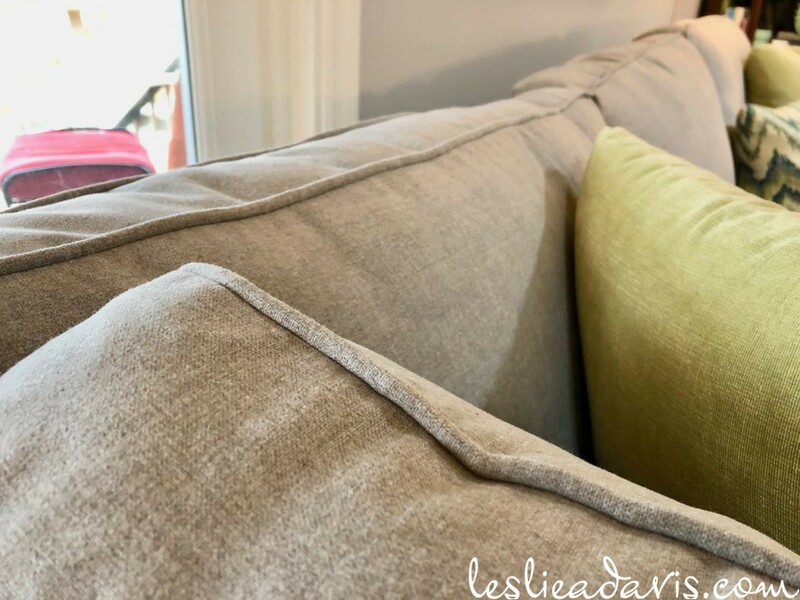 Last year, I added two vintage armchairs and we changed out the loveseat and sofa we had been given to a pair of matching petite loveseats. 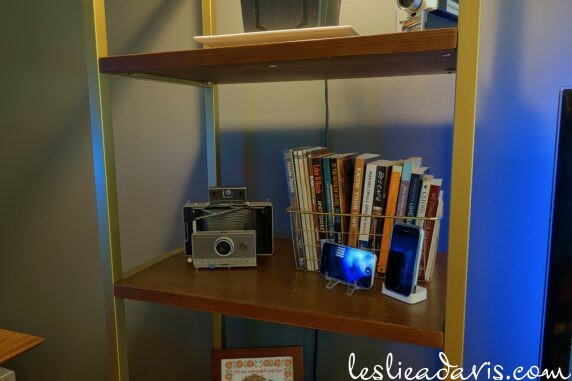 The front end of the room was empty-feeling, so I brainstormed some ways to add visual weight to that side of the room. The exterior side wall has an off-center window, so I wanted something to balance the window without adding too much visual weight. 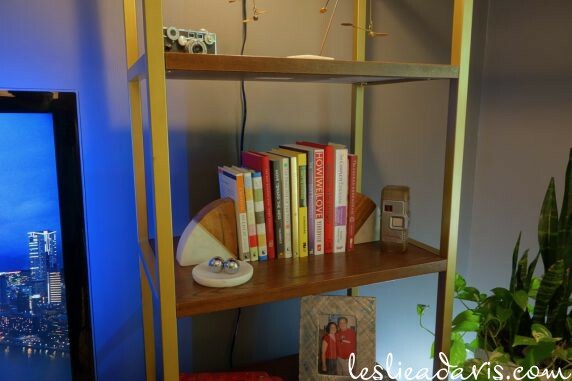 I found a gold and glass etagere on Ballard Designs that I loved, but it was more than I wanted to spend. 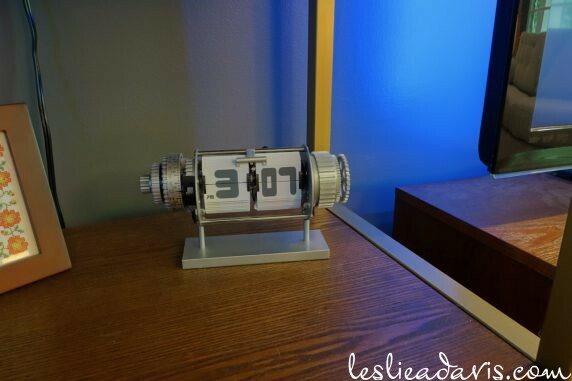 After a little research, I found a piece that looks just like it for a fraction of the cost on Amazon. 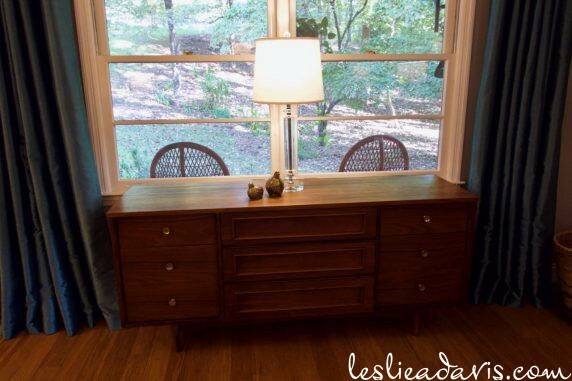 To fill out the space under the front windows, I decided to find a vintage credenza or dresser. 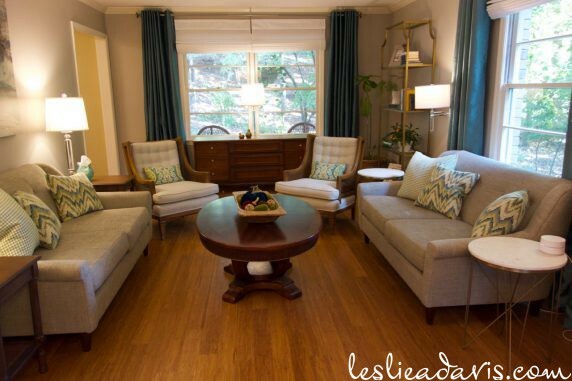 Mid-century style furniture tended to sit lower to the ground and it was easier to find wider options in this style as well. This 9-drawer dresser was the perfect size for this spot, not too deep so it does not block the walking path and not too high so it doesn’t block the bottom of the windows. The final piece I need to replace in this space is the coffee table. Our current one was an inexpensive Craigslist find when we first moved in, just to get something in the space. It works fine, but with our furniture being more petite now, it feels a little big and heavy. I’ve been searching for inspiration, and finally came across a picture of this vintage coffee table I love. The problem will be finding one for sale and determining if it is more that I would want to spend. The stone top would tie into the side tables and the caned shelf would go really well with my armchairs. 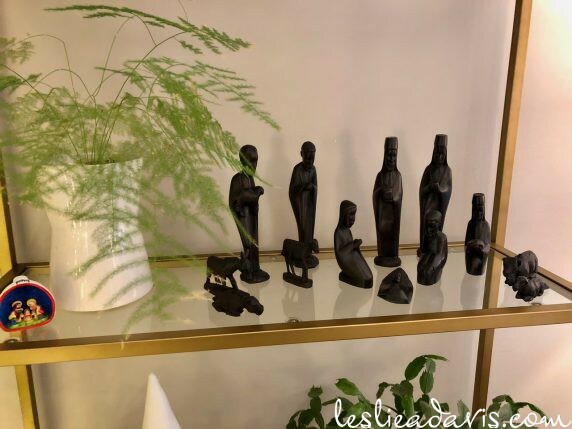 This entry was posted in Living Space on September 23, 2018 by Leslie. We have been working on redecorating Bradley’s office since February and we are getting close to finishing. For years, his office has just been a collection of second-hand items that sort of just ended up together. He has recently been working equally between his desk and an armchair, so we decided to down-size his desk space and emphasize a lounging area in the office. This was one of the only rooms in the house that I hadn’t repainted since we moved in. It was a nice soothing blue. 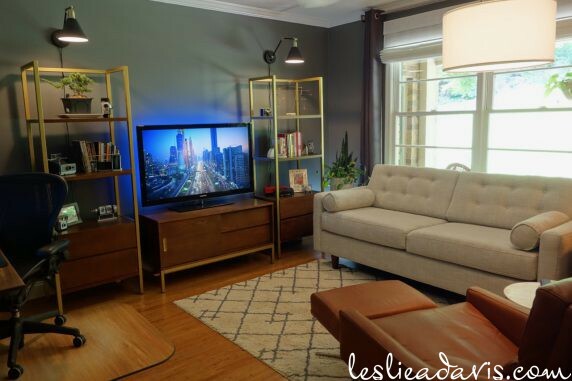 Our new vision for the room centered around a warm, cozy mid-century-inspired atmosphere, so I brought home paint chips from Sherwin Williams in every shade of medium gray. We settled on Westchester Gray, and I love it. 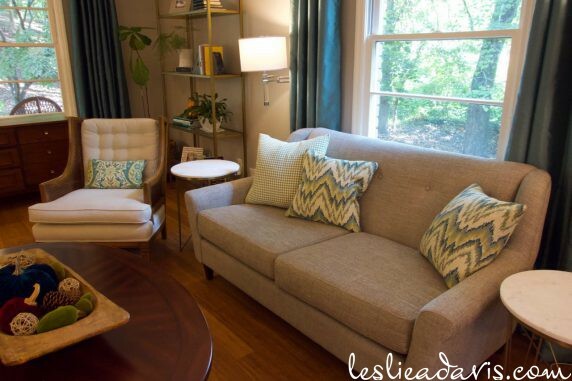 To keep a mid-century look, we chose curtain panels similar to the wall color from Tuesday Morning. 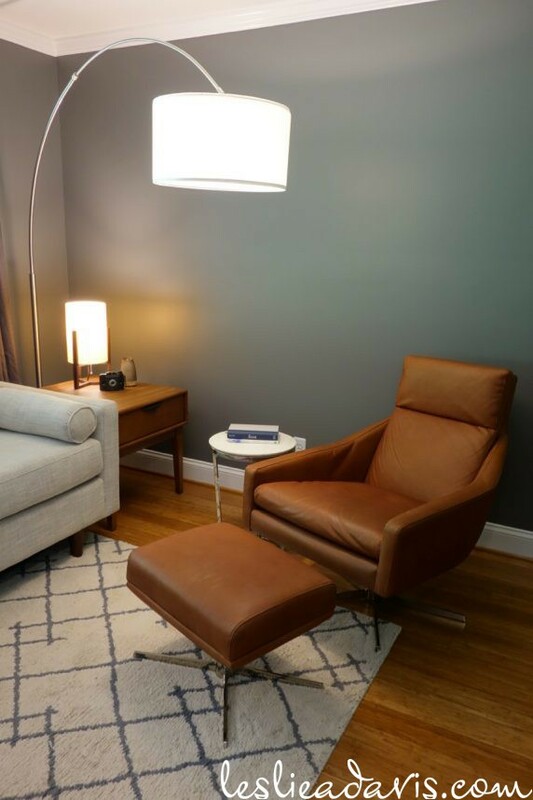 Bradley had always wanted an Eames lounge chair, but after seeing the Austin chair at West Elm, he decided to go with it in Chestnut leather. He also envisioned a wall with a television flanked by bookcases. I spotted the Antwerp line at Target and liked how the bookcases are airy at the top, but grounded by a couple of solid drawers at the base. 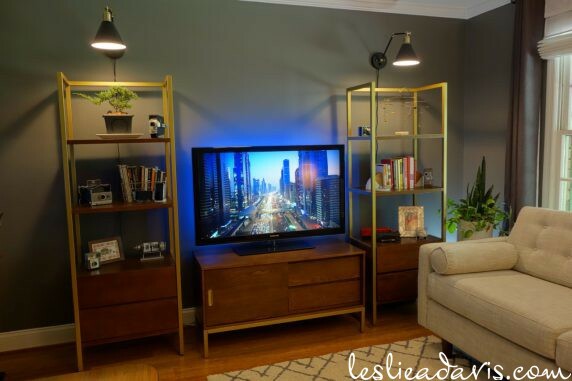 It was also a good way to balance the budget for the room – spending a little more on items like the chair and a little less on the tv wall. The rug is also from Target – the Kenya Fleece Rug in cream. 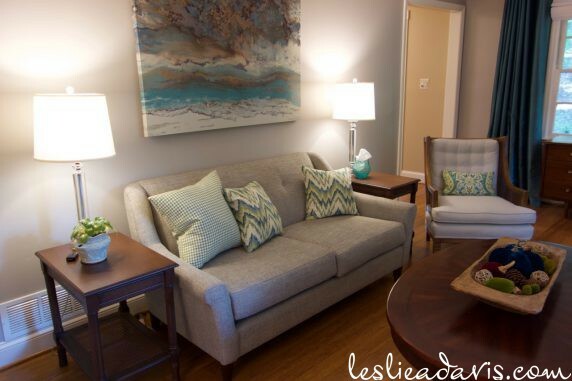 The sofa is from Craftmaster and the end table came from Houzz. 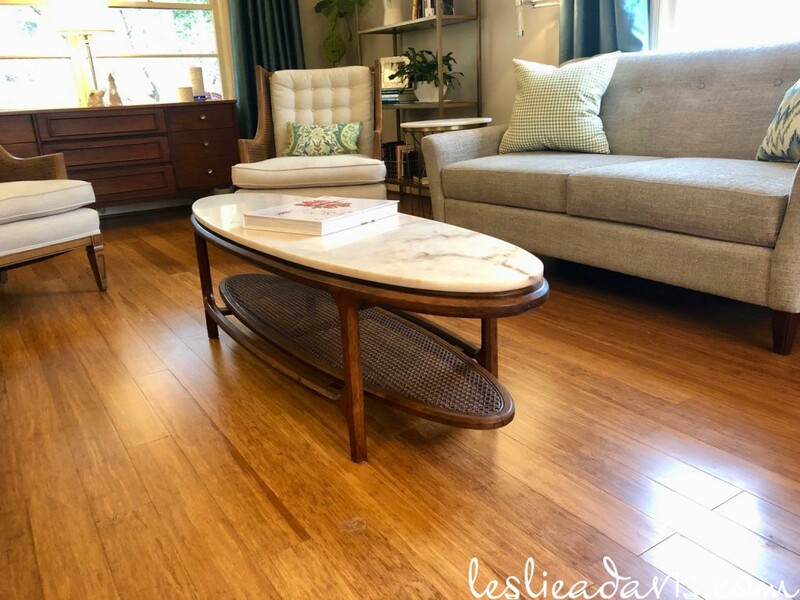 The round side table was a compilation of a base from a table we got from Tuesday Morning and a marble charger-turned-tabletop from Wayfair. 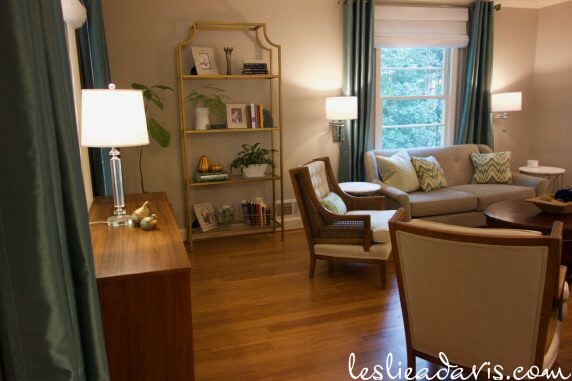 Bradley had been wanting an arc floor lamp, so I found one at a reasonable price at Wayfair. 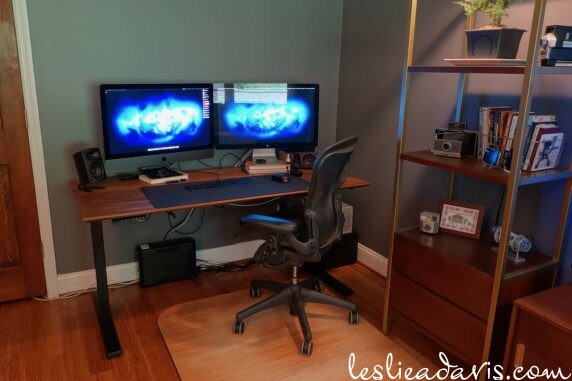 His desk at work is an adjustable-height desk, and he wanted to replicate that at home, so he ordered a motorized desk base from Amazon. The desk top was a custom piece from tablelegs.com made of walnut. 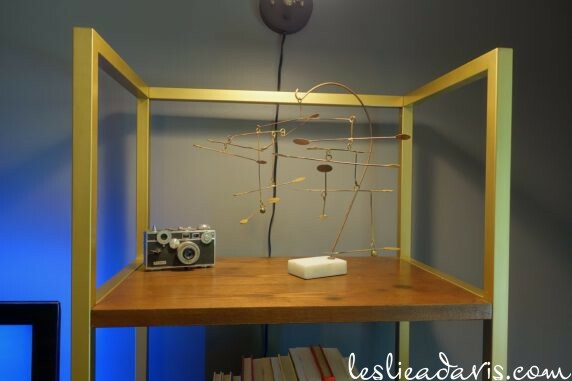 One of our last hold-outs is a lamp for the desk area to brighten up this dark corner. I’m slowly working on filling the bookcases. Bradley has a collection of old cameras so I used some of them sparingly. 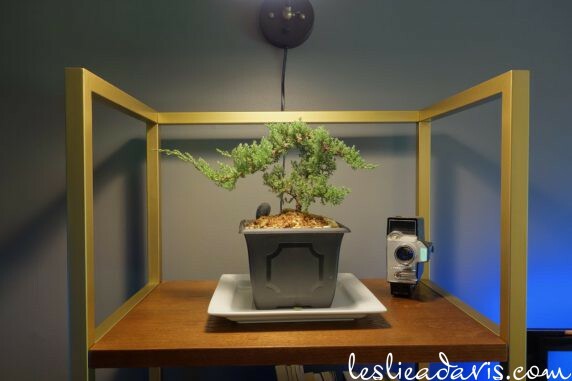 He loves bonsai trees, so I got him one I found at Walmart. The retro clock was a gift I gave him years ago after he saw one at one of our favorite little quirky restaurants – Aretha Frankensteins in Chattanooga. This entry was posted in Office, Our Forever Home on July 13, 2018 by Leslie.